A nice little Mexican restaurant located at the end of the strip mall. You can easily miss it if you are not careful to look for it. However you will be rewarded by a very nicely decorated interior as you can see in the picture. Definitely not your typical local Mexican restaurant. The food was also good and fresh. Overall a solid Mexican place to get your Hispanic food kick! 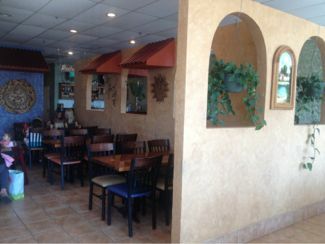 A nice, Mexican family run establishment with some very authentic dishes so far from their native land. Very attentive service and super generous portions. There are, thankfully, some spicy dishes for those of us that like it hot.